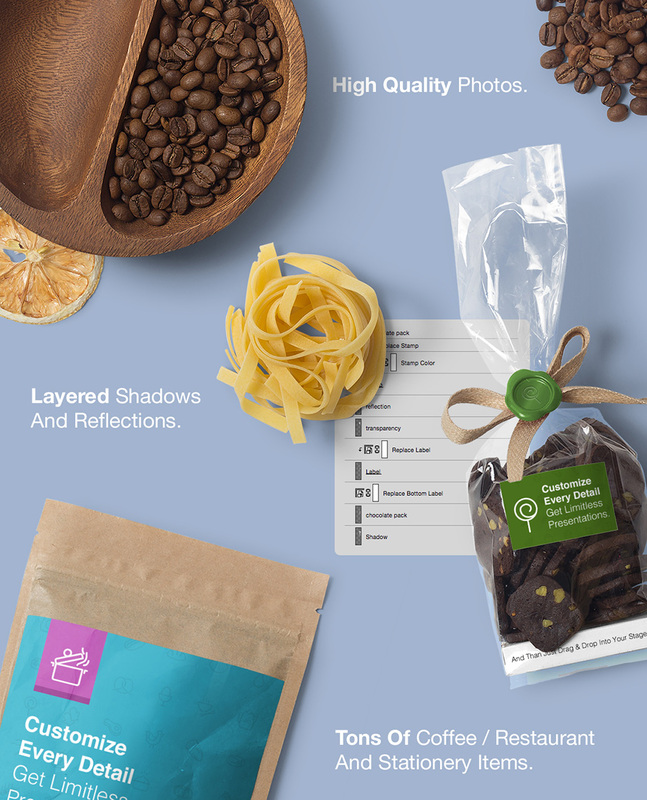 This is a comprehensive mock up pack for those creating branding for coffee shops or restaurants. Included are tons of photos and customizable mockups. We have also included some cool photo mock ups. This is all you need for a unique presentation of that awesome diner brand you’ve been working on. We’ve taken some photos with the same items in this pack. Some of them are used for a packshot and some of them for showing your designs off more effectively. You can change both the ground and wall textures. In addition, there is a pre-made light setup in every photo mockup. We’ve created some .PSD files which allow you to just drag and drop your work. If you have no time to setup a scene with tons of elements, we’ve made it for you. All you need to do is move, rotate or scale items as you see fit. Also you will get 17 different high quality textures to use as background. You can also you these textures in photo mock ups. Coffee roaster packs, organic tea packs, paper coffee cups, flour packs, little sugar packs, teabags, ice cream and yogurt packs, chocolate packs, bread and rusk packs, pizza and pasta packs and many more. You can change the base color, and label the designs. Many different materials and sizes. 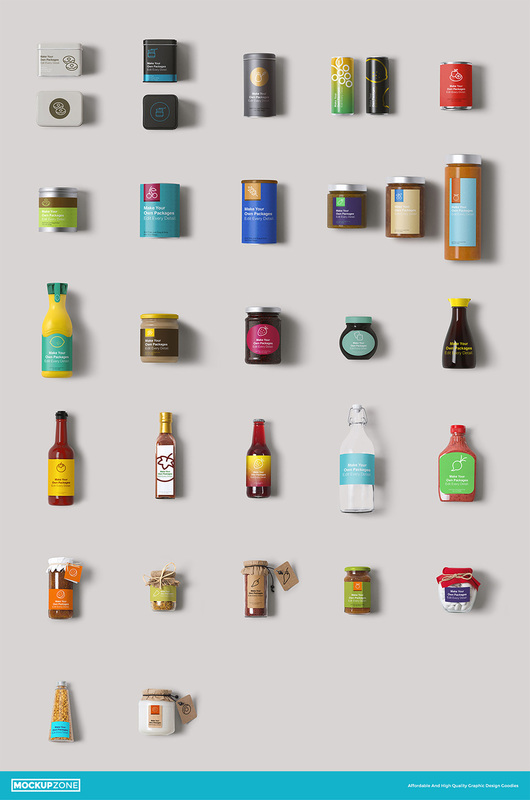 Metal or glass packs, Coke cans, some plastic drink packs, sauce and jar packs, hand-made organic product packs. All of them delicious and easy to customize according to your brand. 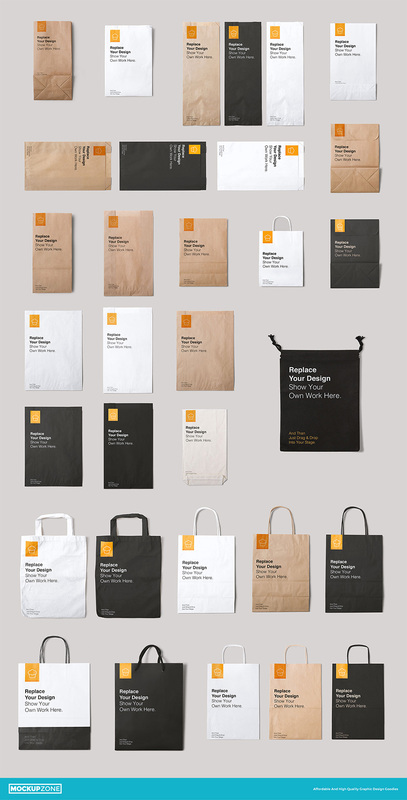 Craft, white and black bags. Many different sizes and looks great with other items. Includes paper and cloth bags. This file is not for only package designers. 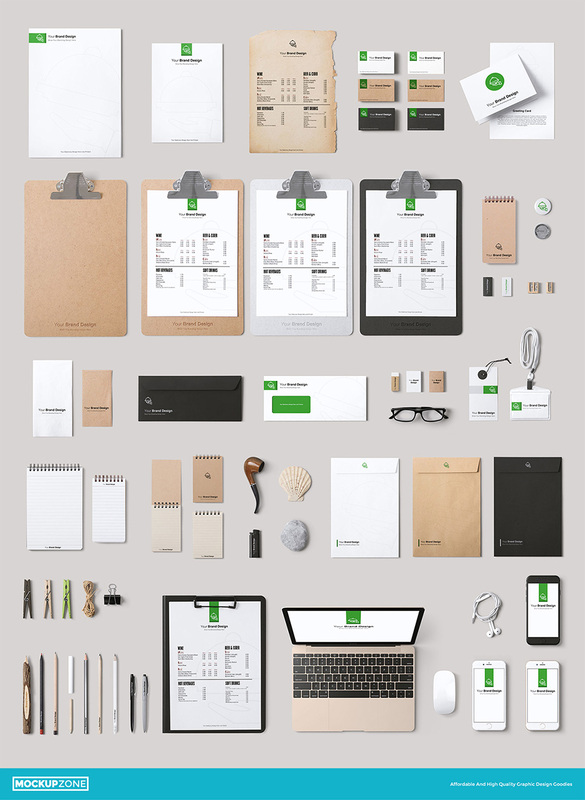 We’ve also included stationery items: Business cards, A4 letterhead, A5 paper, greeting card, paper pad for menu designs, notepads for waiters, envelopes, pen and pencils, a brand new Apple Macbook (with all color options) and an iPhone 6 (also with all color options). Many different sizes and materials. Plates,vases, porcelain cups, spice jars, kettles, chopping boards, pans and pots, cases and many more different items. Some of them customizable and you can simply place your designs on to them. Can you imagine a table without a plant? 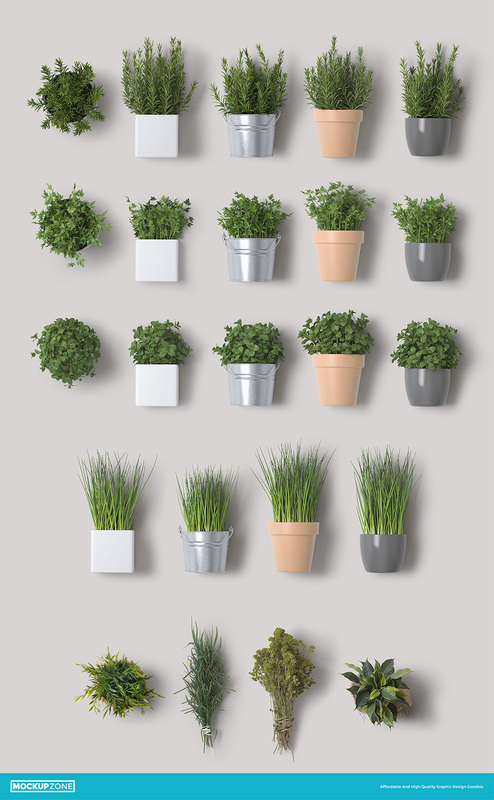 And all of them edible: Thyme, parsley, mint, green onion and some additional plants for your scenes. 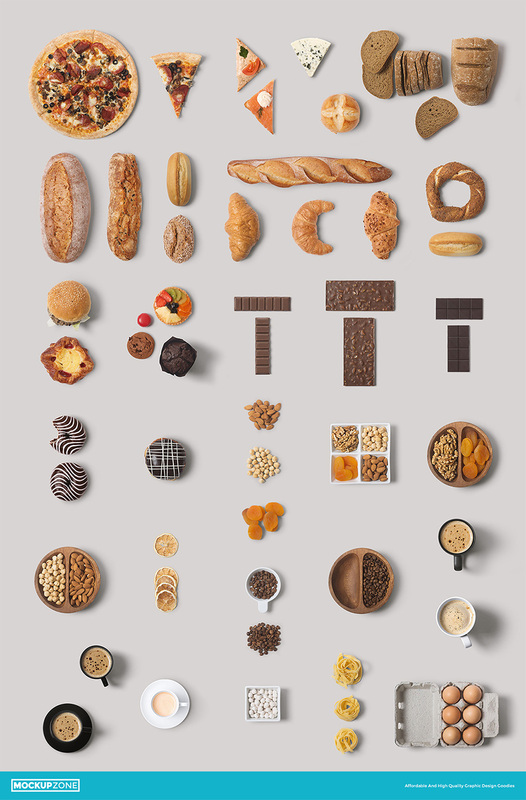 We’ve included many different edible items in this pack: Pizza, breads, croissant, hamburger, cake, pasta, chocolate bars, donuts, coffee beans, egg and many delicious items. Unfortunately, you can only drag and drop these into your scenes, you can’t actually eat these – boo. File size is approx 1.5GB (3.16GB unzipped), offered as a single download, as well as a 2 part download. Hey guys, quick question… is this DesignCuts bundle the same as their product on Creative Market at the same price, or does this DesignCuts bundle include more than one of those products? I would check myself but the CreativeMarket site is extremely slow for some reason and I’m unable to compare all items. The reason I ask is because if it’s the same price as that site, I will just wait to purchase. But if this bundle includes multiple products in one, I would like to purchase. Thanks. Thank you so much for reaching out to us and I’m so sorry to hear that you were having difficulty searching on Creative Market’s website- rest assured I can certainly help! Hello! How much is a set with the corporate style for the coffee the format of “coffee to go” ? We are the media : badge, blank, card, cupholder, envelope, Kraft paper envelope, sugar, tea bags, gum, napkin, apron, magnet, ballpoint pen, flavor in cars, USB flash drive branded, key chain, Cup. For example, a keychain, a magnet and flavor in cars, you can make the logo round. Thanks so much for getting in touch! Rest assured, I’m here to help 🙂 I’ve just sent you an email to assist you with your query! For the vertically oriented items (eg cups, bottles, bags, plants, etc), would they include shadows as if they were standing (on their bottoms), as opposed to laying down on their backs on a surface? Thanks! I hope it helps, and please don’t hesitate to contact me should you have any other questions. I’m always happy to help! Absolutely love this mockup pack. I did see that part of it was included in a previous bundle that I have purchased, what I’d like to know what was included in the “The Contemporary Creative Design Collection” and what is extra as part of this bundle? Is there likely to be a version of this that will include only the parts that weren’t in that bundle? I am so glad to hear that you’re absolutely loving this one, thank you so much for taking the time to let us know! 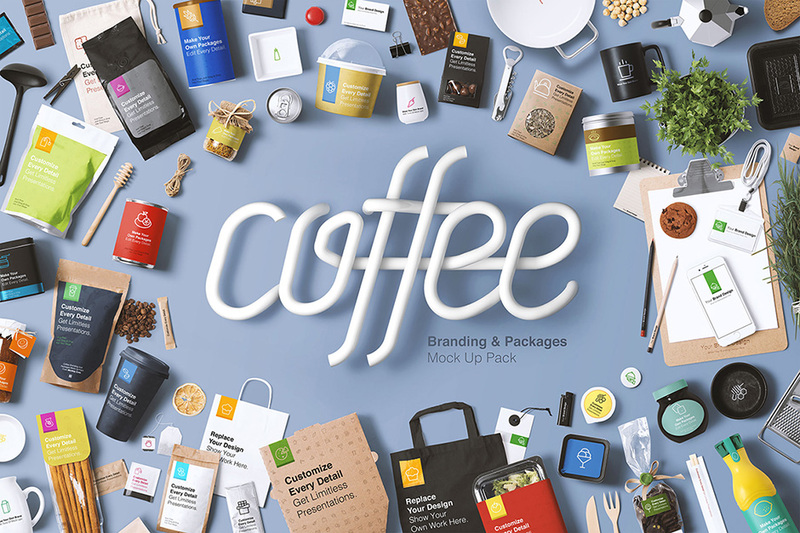 This Coffee Branding & Packages Mockup is in fact the full package, as opposed to the resource featured in our The Contemporary Creative Design Collection bundle. What you saw in the bundle was a specially curated condensed taster version whereas here you get access to the complete collection. Unlike our bundles Chad, our marketplace items do not expire. As we are able to feature the whole package in the marketplace for purchase, this means we wouldn’t need to segment it again to feature in another bundle :). nice collection! i’m slowly getting to the point of needing mock-ups and this is a real winner. will it be available for a while? All these individual packages seem to be more expensive pricing on the same products. Thanks for the comment and feedback on our marketplace. The items in the marketplace are at their regular price and unlike when they were featured in our bundles, the marketplace items have no expiry. The marketplace items have unique discounts and other purchase options were you can make savings. If you prefer the discount that our bundles give dont worry- our bundles will still be running alongside the marketplace and our next bundle will be released on Tuesday March 1st!